This is an abridgement of letters Anton Chekhov wrote to his family and friends during a working vacation to Russia's Far East, and of the report on the conditions on Sakhalin Island he wrote for the Tsar's government. The report almost reads like one of Chekhov's stories. 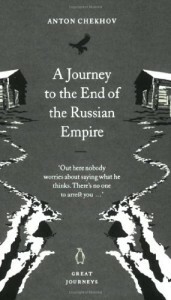 It's full of rich description and largely sympathetic protrayals of the poor souls who populated one of the remotest outposts of Russian imperialism. And the letters describe a Chekhov who was having a great time getting to Sakhalin. Despite some horrid traveling conditions and seemingly endless delays, Chekhov was never healthier and observant in his life.